Bilstein B8 Performance Plus dampers for the fixed-suspension Corvette C5 / C6 are a performance upgrade to OE dampers and are designed to be used on lowered vehicles. Bilstein B8 Performance Plus dampers are the ideal solution for pairing with a lowered vehicle for improved handling and sportier look with the added benefit of world-famous Bilstein quality. If you want to experience a new level of handling and stability while retaining the comfort you’re used to, consider Bilstein’s B6 Heavy Duty shock absorbers and strut assemblies. They feature Bilstein’s renowned gas-pressurized monotube construction and are available for all types of vehicles. Off an 88 Chevy Corvette C4 coupe. We want you to be 100% happy with your order. Bilstein B6 Heavy Duty monotube gas pressure shocks are the ideal choice for most applications. These shocks provide improved handling and stability, without sacrificing ride comfort. 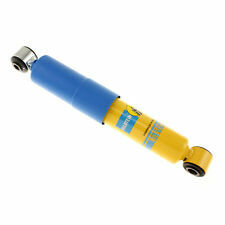 2 - Bilstein #24-029759 Front Shocks, 46mm. 1963-82 Chevrolet Corvette. Push your muscle car into supercar territory with our new line ofBilstein® High Performance Shock Absorbers ! These shocks use the latest in suspension technology, including Teflon® coated surfaces for reduced friction andBilstein ®'s patented digressive valving! Trending at $93.19eBay determines this price through a machine learned model of the product's sale prices within the last 90 days. Set of 2 Shock Absorbers, Rear Side. Chevrolet Corvette. Shock Absorber. 1989-1996 Exc. Z51 Suspension Rear. B6 Performance dampers will provide improved safety and handling performance with the added benefit of world-famous Bilstein quality. Application Summary - 2000 : Chevrolet Corvette 1987-1984. Title : Bilstein Shock Absorbers. B8 Performance Plus dampers are the ideal solution for pairing with a lowering spring for improved handling and sportier look with the added benefit of world-famous Bilstein quality. Series : B8 Performance Plus. Part: Shock Absorber. Model: CORVETTE. Make: CHEVROLET. Year: 2007. 1953-62 Chevrolet Corvette. Push your muscle car into supercar territory with our new line ofBilstein® High Performance Shock Absorbers ! These shocks use the latest in suspension technology, including Teflon® coated surfaces for reduced friction andBilstein ®'s patented digressive valving!